Portsdown is the seven mile chalk escarpment that fills the horizon immediately to the north of Portsmouth. The scrub and grassland mosaic that make up much of its southern slope is home to a wide range of wildlife. 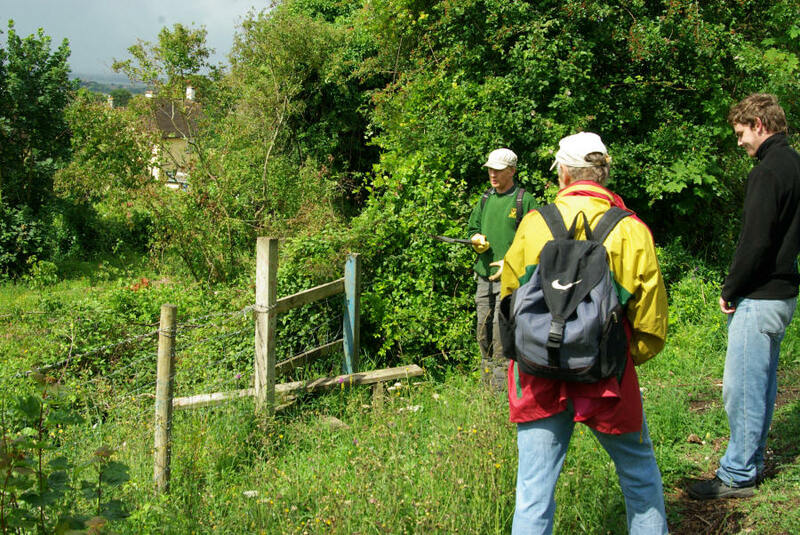 Orchids, bush crickets and butterflies are frequently encountered - as are the Portsdown Conservation Volunteers. My what a view - but what are those people doing? The ridge of the Hill is a popular place to admire striking seascapes or take in the pleasing scene provided by the Forest of Bere as it sweeps northwards to the South Downs. 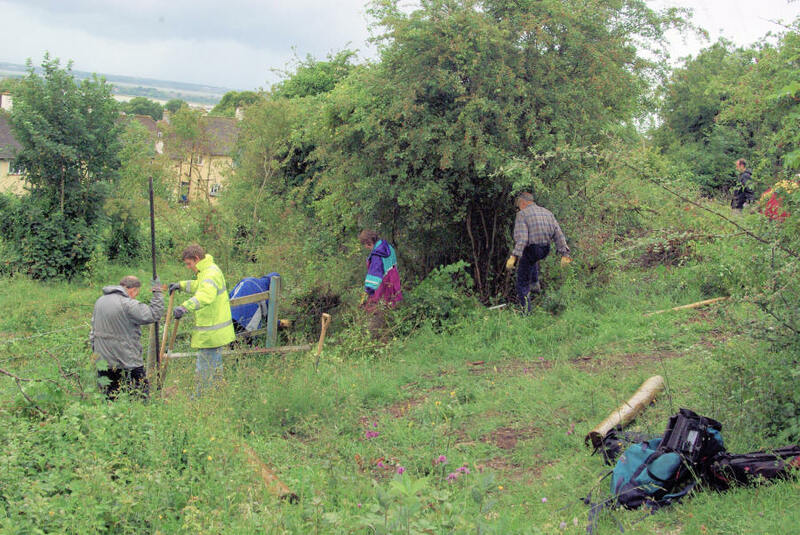 The more observant visitors on Wednesdays and some Sundays will also spot conservation volunteers going about a valuable task that helps safeguard the Hill's wildlife or improves access. 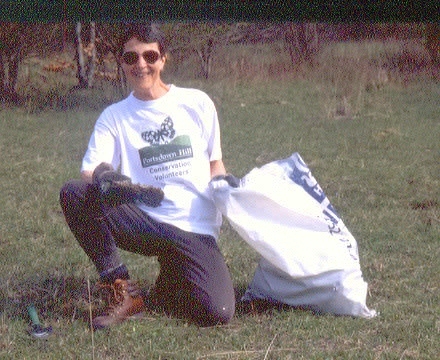 The picture shows volunteers at work on 28th Feb 2002. 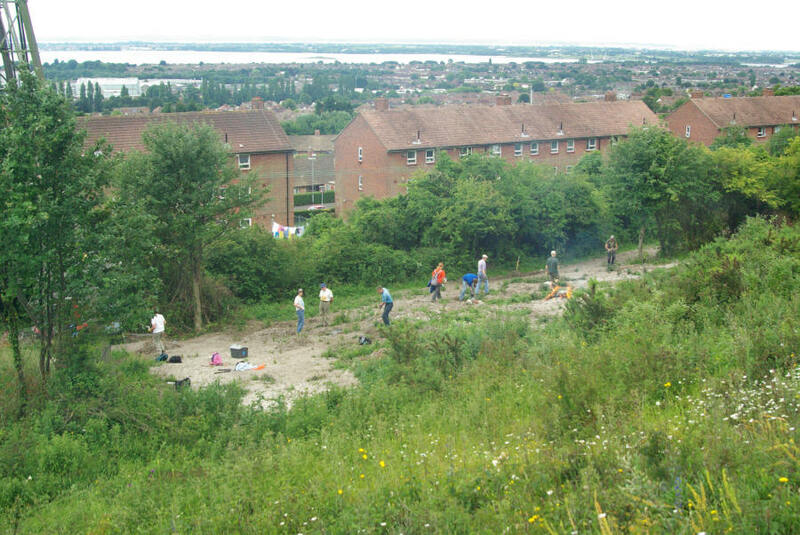 The PCV work closely with Portsmouth City Council's Portsdown Hill Countryside Service which is based at Fort Widley - one of the Victorian hill forts that dominate the Hill. A major aim of the volunteer group is to return large expanses of Portsdown to species-rich downland at the expense of scrub and rank grass that is spreading fast. Most people who have had anything to do with conservation work in the past will instantly realise this is a recipe for endless scrub bashing. For those reluctant to tackle dense hawthorn stands there are some points to bear in mind. Whilst it is true that 'justifiable aboricide' ( scrub clearance) is a regular feature of our winter task programme, it is reassuring to know that the work is done in conjunction with grazing. The reintroduction of cattle and recent trials of goats means that scrub tends not to grow back (they eat it) and there are cattle round up tasks to look forward to. Of course, it is not all chopping down prickly bushes for the PCV. Haymaking tasks add diversity to local meadows. Hedge-laying and hedge-planting regenerate lost habitats on adjacent farmland. Paths, stiles and gates are built to improve access. We have cleared tons of choking silt from Hookheath pond, without finding a single trace of the horse or cart, or indeed the driver that allegedly sank there. As with any group that concentrates its efforts in a distinct locality there are opportunities to monitor the benefits that conservation work bring. Volunteers carry out butterfly transects, insect and bird surveys as well as recording the effects of grazing on the vegetation. The PCV meet every Wednesday and one weekend a month, call 023 9238 9623 for more information or come along to the east gate of Fort Widley next Wednesday at 10. In these pictures work is being undertaken to replace a stile with a kissing gate. 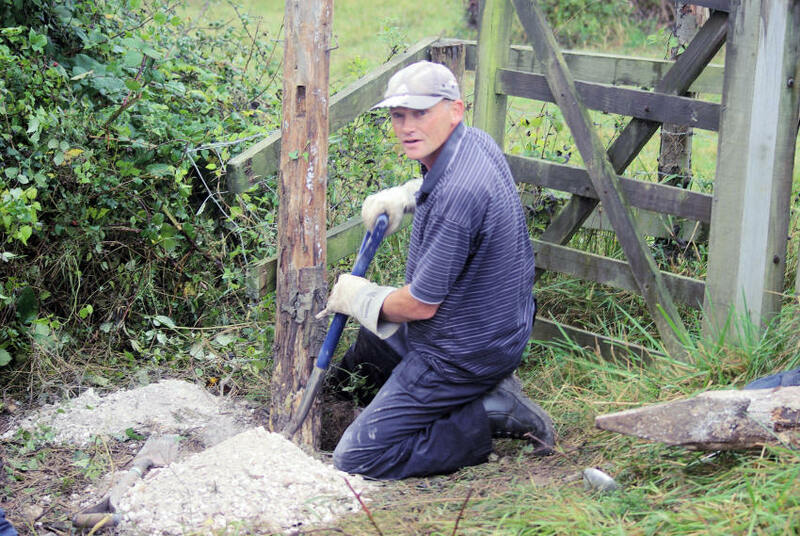 The pictures show the site on our arrival in the morning, work in progress on putting in new posts and at the end of the day a new box strainer and posts to take new fnecing before dismantling the stile. We were working in early July 2011 on restoring the habitat after the Electricity people had been working on their pylons. On 1st December 2010 we were renovating fencing originally installed using holm oak posts. These have proved to be unsatisfactory and are being repla ced. Notice we work in all weathers!